The memorial to Ulysses S. Grant was dedicated in 1922. It is located in Union Square, west of the U.S. Capitol Building, by the Capitol Reflecting Pool. In late 2011, the care of the Grant Memorial was transferred from the National Park Service to the Architect of the Capitol. The bronze elements were restored in 2016. Situated in Union Square at the edge of the reflecting pool and backed by the United States Capitol, the bronze and marble General Ulysses S. Grant Memorial honors the Civil War Commander of the Union Armies who was also a two-term President (1869–1877). It marks the eastern terminus of the National Mall and faces the Lincoln Memorial almost two miles to the west, symbolically linking the President and the General who fought to save the Union. Celebrated as the largest equestrian monument in the United States, it is 252 feet long by 71 feet wide by 44 feet high and is a tour de force of monumental sculpture. It is a remarkable achievement by a sculptor who, with little formal training, toiled twenty years to translate his grand vision into cast bronze. At two and one-half times life size, the figure of Grant mounted on his horse forms the monument’s apex atop a pedestal that is over twenty-two feet high. Four lions lying with heads erect, guarding the flags of the Army and the United States, mark the corners of an imaginary pyramid’s base and visually align with the life-size Cavalry Group on the north and Artillery Group on the south. The monument is an essay in opposites, contrasting Grant’s customary stillness while observing battles with the turbulence of the charging Cavalry and Artillery. The symmetry and simplicity of the classically styled platform, suggesting a reviewing stand, provide an effective stage for the heightened realism of the bronze components. Thirty years after General Robert E. Lee's surrender at Appomattox ended the Civil War, veterans who had served under Grant in the Army of the Tennessee launched a campaign to erect a monument to General Grant in Washington, D.C. In 1901, Congress passed the Hepburn Act, authorizing funds for a memorial at a cost not to exceed $250,000; this was the largest Federal sculptural commission to date. Congress appointed the Grant Memorial Commission to identify a site and oversee a competition. In March 1902, the Commission solicited proposals, including the stipulations that artists had to be American citizens and that all sculpting and casting had to take place on American soil. Twenty-three artists submitted twenty-seven designs. The selection panel, including prominent sculptors Daniel Chester French and Augustus Saint-Gaudens, reviewed the plaster models and chose the team of Shrady and Casey, a decision contested by older, more established artists, particularly the runner up, Charles H. Niehaus. The Grant Memorial on the west side of the U.S. Capitol. When the Grant competition began, planners had not finalized the memorial’s exact location, which was originally to have been one of two sites south of the White House. However, a plan developed by the McMillan Commission to improve the National Mall offered a potential new site that was soon seen to be the ideal choice: Union Square, proposed for the area then occupied by the Botanic Garden to the west of the Capitol. Inspired by the Place de la Concorde in Paris, Union Square appeared on drawings as a large plaza containing three equestrian statues honoring Civil War generals: Grant, towering in the center, would be flanked by William Tecumseh Sherman and Philip Henry Sheridan. It is likely that this tripartite arrangement influenced Shrady and Casey’s design, which features three sculptural groups. As Shrady worked on the monument's various sculptural elements, he forged a close relationship with Roman Bronze Works, a Brooklyn-based foundry noted for its exceptional craftsmanship. 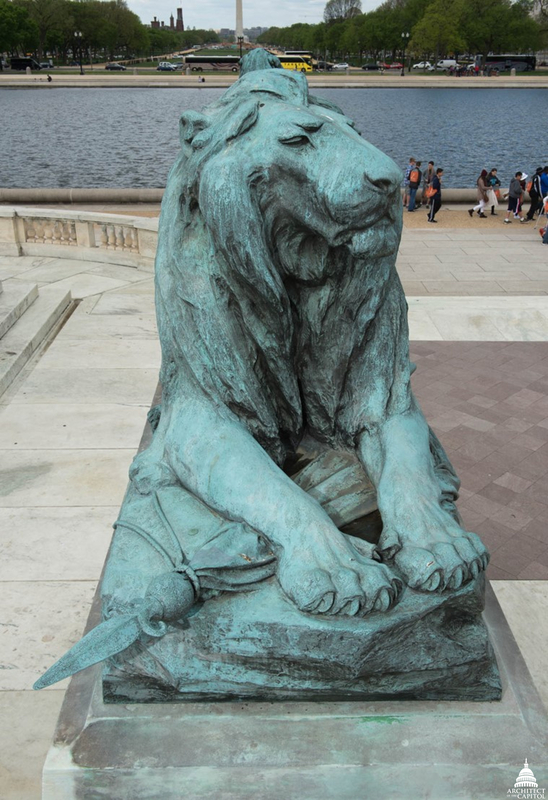 The sculptor began with the monument's simplest bronze elements, the lions. One pair was completed in 1906, and by the spring of 1908 the architectural superstructure was in place and all four lions were placed on their pedestals. Next came the Artillery Group, at the time the largest bronze group ever to be cast in the United States. Weighing fifteen tons, the ensemble required expert engineering and was assembled on site in 1912 from four large sections. In 1915 Shrady completed the modeling of the Cavalry, and it was installed the following year. Finally, in 1918, Shrady received approval for the full-scale clay model of the mounted Grant, which was cast and installed in 1919. Only the low-relief infantry panels for the sides of Grant’s pedestal remained to be completed. Shrady tragically died two weeks before the memorial's dedication on the centennial of Grant’s birthday, April 27, 1922. Shrady's assistants Edmond Amateis and Sherry Fry finished the panels based on his sketches, and they were installed in 1924. The Cavalry group of the Grant Memorial. 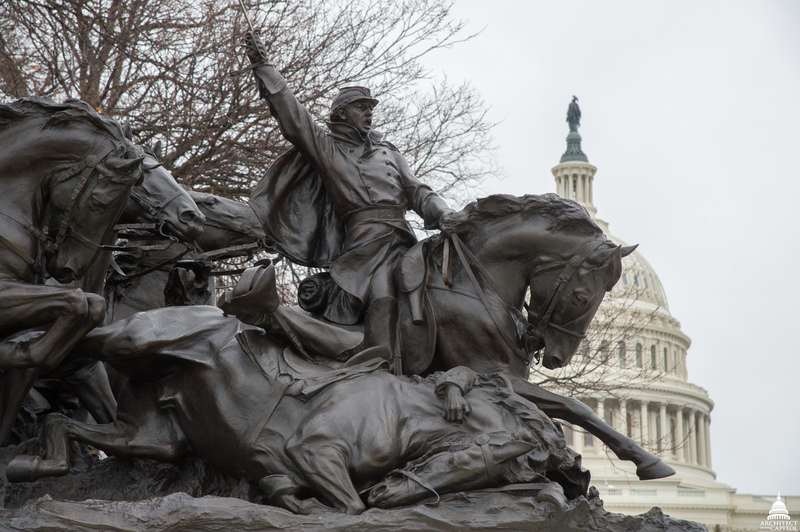 The Grant Memorial continues to captivate viewers with its immediacy and dramatic power. The low height of the flanking groups of Cavalry and Artillery, situated across from marble exedras built into the monument, allows viewers to imagine themselves amid the action as if in the heat of battle. Realistic details at eye level, including military trappings and uniforms, rocky terrain, battle debris, horse musculature, and the pained expressions of individual soldiers, endow the scene with authenticity. Shrady researched and studied all aspects of the monument intently, even observing specially staged cavalry and artillery drills at the United States Military Academy at West Point to ensure accuracy in the movement of the two groups. In the Cavalry group, seven horsemen of the color squad of a cavalry regiment stampede onto the battlefield, about to crush a fallen soldier, one of their own. Weapons, figures, animals, and terrain merge into a riveting, visual narrative. In the Artillery Group, soldiers struggle to steer a cannon into position, but the team of three horses lunges and twists as the lead horse, reacting to a broken bridle, rears uncontrollably. In sculpting the Cavalry and the Artillery groups, Shrady used painstaking detail to convincingly convey the idea of individual soldiers' sacrifices in the context of a national purpose. Similarly, in his likeness of Grant astride his Kentucky thoroughbred, he sought to capture an authentic portrait of the great military leader. Shrady synthesized all available sources, including the death mask of Grant in the Smithsonian and the recollections of his own father, who was Grant's personal physician during his last illness. As described in the memorial's 1924 commemorative book, "truth and simplicity were the pervading traits which tinged Grant's other qualities." Shrady portrayed Grant as he often appeared on the battlefield, without a sword, shoulders slightly drooping, and crowned with a tilted, wide-brimmed Army hat. 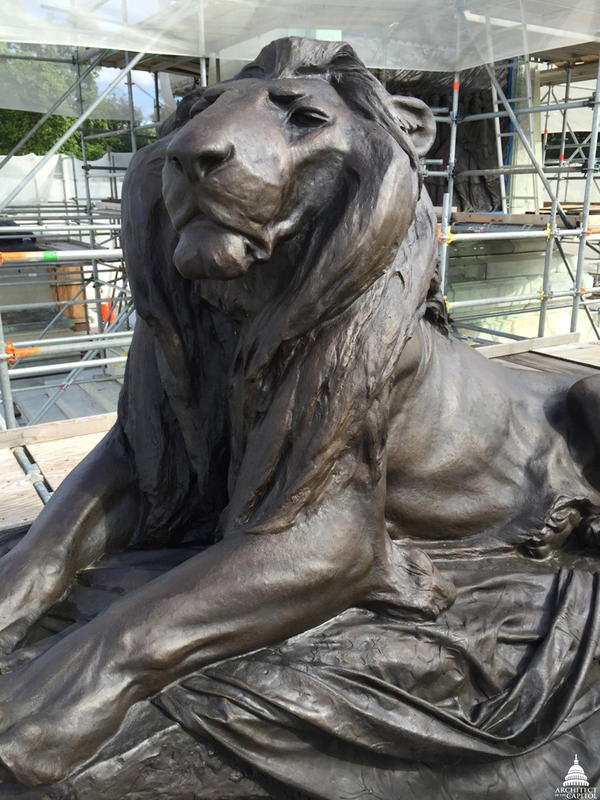 Lion before conservation, left, and after, right, with corrosion removed from the sculpture. In 2015, this captivating monument became the focus of a meticulous conservation effort. Disfiguring corrosion was removed; over 150 castings of missing or broken pieces, from swords to chain links, were reintegrated into the monument. The marble plinths were refurbished, with joints repointed and stains removed. Completed in 2016, this work on the bronze components and marble pedestals allow viewers to again see the subtle details of the original sculpture. Henry Merwin Shrady (1871–1922), born in New York City, completed his undergraduate degree at Columbia University and briefly attended law school there. As a sculptor, he was largely self-taught, observing animals at the Bronx Zoo and modeling small table-top sculptures similar to the work of the European animaliers of the late nineteenth century. His first opportunity to do monumental sculpture was under the tutelage of Karl Bitter, who as supervisor of sculptural production for the 1901 Pan-American Exposition in Buffalo invited Shrady to enlarge his sculptures of buffalo and moose for display. Shortly thereafter, Shrady won the commission to create an equestrian portrait of George Washington for the Brooklyn approach to the Williamsburg Bridge, which was being built at the time he won the Grant commission. Shrady's collaborator on the Grant project, New York architect Edward Pearce Casey (1864–1940) was the more experienced partner. Trained at the l'Ecole des Beaux-Arts in Paris, Casey is also represented in Washington, D.C., by the Taft Memorial Bridge, DAR Constitution Hall, and the completion of the Library of Congress Thomas Jefferson Building. Ulysses S. Grant was born Hiram Ulysses Grant on April 27, 1822, in Point Pleasant, Ohio. Appointed to the U.S. Military Academy at West Point in 1839, he arrived to learn that he had been erroneously enrolled as Ulysses Simpson (his mother's maiden name) Grant. The roll could not be corrected, so Grant changed his name. Upon graduation he was posted near St. Louis, where he met his future wife, Julia Dent. After distinguished service in the Mexican War and at several garrison postings, he resigned his commission in 1854. Volunteering to return to service in the Union cause after the start of the Civil War, Grant held a series of increasingly responsible commands and was the strategist of victories that earned him national attention. He also earned the respect of President Abraham Lincoln, and his achievements at Shiloh, Vicksburg, Chattanooga, and Appomattox were decisive in the course and outcome of the war. After the war, Grant initially supported the reconstruction of the South but grew disenchanted to the point of supporting President Andrew Johnson's impeachment. He ran as a Republican for president and was easily elected in 1868 and re-elected in 1872. His political inexperience and misplaced trust in unscrupulous advisers, however, led to scandal despite his own innocence of corruption. After leaving office, he toured the world with his family and unsuccessfully sought the presidential nomination in 1880. A partnership in a brokerage firm that failed left him bankrupt. He spent the last months of his life writing his war memoirs, which were published posthumously by Mark Twain and ultimately earned his family $450,000. Grant died of throat cancer on July 23, 1885, and is entombed with his wife in New York City, in a mausoleum on Manhattan overlooking the Hudson River.